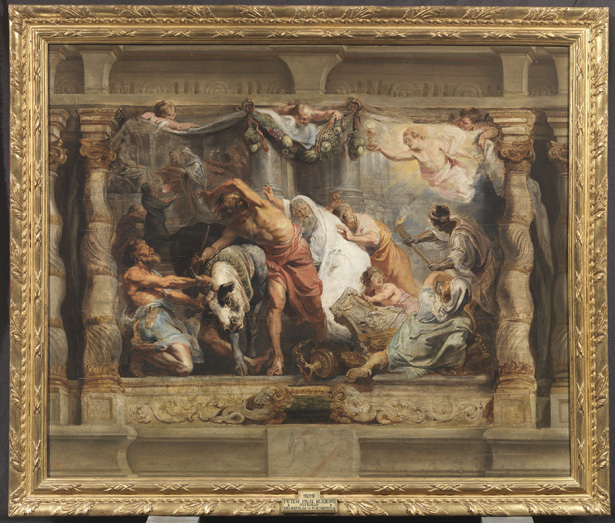 Thanks to a two-year grant from the Getty Foundation as part of the Getty’s ongoing Panel Paintings Initiative, the Museo Nacional del Prado is now conserving a magnificent series of six panel paintings completed in 1626 by artist Peter Paul Rubens, known as the Triumph of the Eucharist—one of the most important commissions of Rubens’s lifetime. The work is being undertaken as part of an international effort to train conservation specialists to ensure that important works of art on panels survive for future generations. A previous collaboration with the Prado under the Panel Paintings Initiative resulted in the conservation of Adam and Eve by Albrecht Dürer, and that effort bore some beautiful fruit, so to speak. 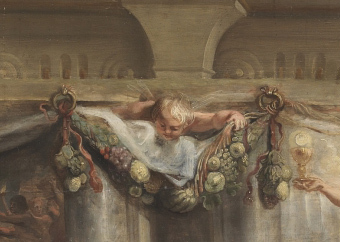 In this case, Rubens used his Triumph of the Eucharist paintings to sketch out the composition of wall hangings for a convent, the Clares de Descalzas Reales, a favorite of Infanta Isabella Clara Eugenia, ruler of the Southern Netherlands and a deeply religious member of the Spanish royal family. Though intended as plans for larger tapestries, Rubens’s sketches are exquisite in their own right and offer a fascinating glimpse into his artistic process, as well as a beautiful record of his impressive brushwork. As gorgeous as the paintings are, the reverse of Rubens’s masterpieces also tell an interesting story about their history. Six of Rubens’s paintings from the larger series have been preserved at the Prado Museum, but all now show structural damage due to previous well-intentioned interventions. At an unknown point in their history, the panels were thinned and restraints were applied to flatten them out, a common past practice. These interventions have caused cracks, deformations, and uneven surfaces in the wood, which now threaten the beautiful painted surfaces. To address the damage, the panels require some very specialized and skilled conservation. Though advances have been made in panel paintings conservation in recent years, only a handful of individuals worldwide have fully mastered the skills required to become seasoned conservation experts, and it’s expected that nearly all of these experts will retire within the next decade. 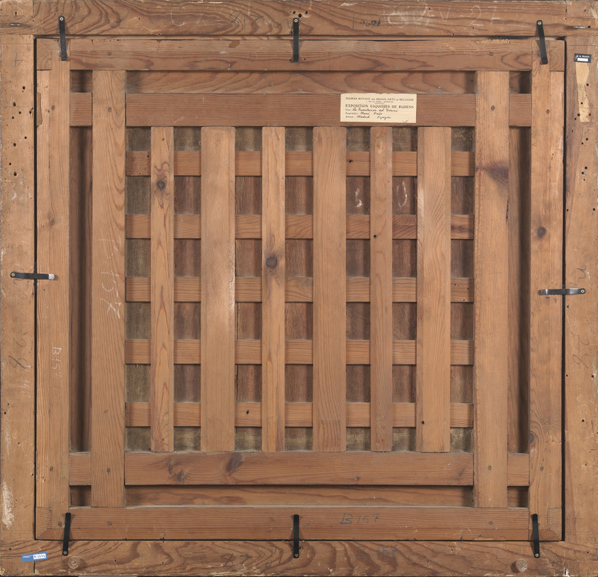 It’s an even more important issue when you consider that the tradition of painting on wood panels was widespread in Europe from the late 12th through the 17th centuries, and panel paintings rank among the most significant works in American, European, and Russian museum collections and in religious buildings. The good news is that the Getty’s Panel Paintings Initiative is acting to ensure that the next generation of conservators is prepared to step into the void left by those retiring. 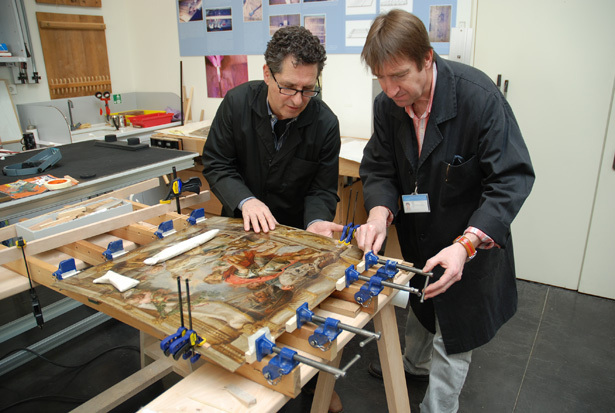 The initiative is a six-year effort to train and mentor the next generation of panel paintings conservators. 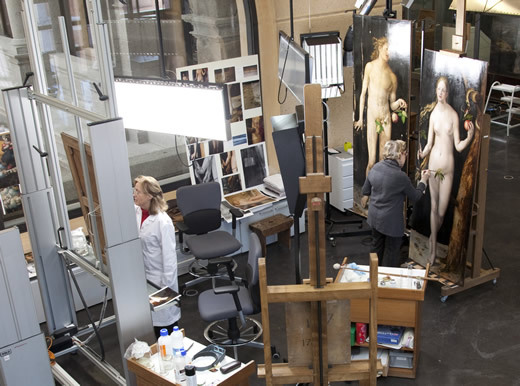 Understanding the pressing need for skilled conservators, the Prado will use the restoration of Rubens’s important panel paintings as a major opportunity for training a number of conservators at different levels. 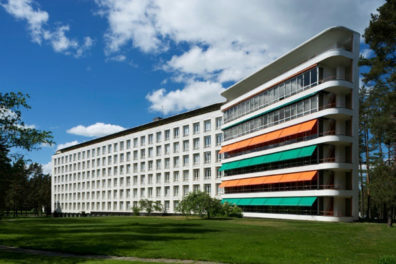 The more seasoned conservators will gain experience on the challenging parts of the treatments as it progresses, while the more junior conservators will learn the basic techniques to treat splits, cracks, and other structural problems. All of the trainees will benefit from observing the complex decision-making process involving conservators, curators, and conservation scientists. The project will be led by Prado conservator José de la Fuente, who, it’s interesting to note, also received expert training at the start of the Getty’s Panel Paintings Initiative. Conservator George Bisacca from The Metropolitan Museum of Art will provide his expertise as well, consulting on the project. As with any highly specialized field, it’s crucial that experts in the conservation of panel paintings have the opportunity to pass on their acquired knowledge to others in order to ensure the long-term care of these truly exceptional works of art. Visitors, scholars, and Rubens enthusiasts alike also will benefit once the Triumph of the Eucharist series is newly conserved and on view at the Prado for all to see. Now that’s some beautiful fruit. My childhood and lifelong favorite painting was Rubens: Triumph of the Holy Sacrament over Ignorance and Superstition (as I recall), at the Cleveland Art Museum. I returned to Cleveland after many years – the painting was gone – and no one knew anything about it. I found a little old lady at the Terminal Tower who said that this wonderful painting was found to be a fake, at a cost of $1M and was removed. This raises two questions: where is the painting now, and are we collectors of art – or signatures? I’m afraid we don’t know this story, though you might try contacting Cleveland directly. Might you be referring to Rubens’s “The Triumph of the Church”? 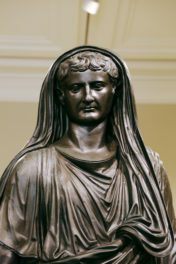 It is in the collection of Cleveland Museum of Art, and believed to be by a follower of Rubens. Like many successful artists, Rubens maintained a robust workshop, and many works in which he had a hand may have been made by pupils. There are several reasons why this painting (or indeed any artwork at any museum) might not be on view during a given visit. Museums routinely lend one another artworks, which requires them to be temporarily away from their normal homes. Sometimes works are temporarily removed from a gallery to be photographed, or studied and conserved, or even moved to a new gallery or exhibition within the same museum. And indeed, sometimes museums deaccession works (sell or donate them). There are many reasons for this; perhaps a work lies outside a museum’s core collecting area, or is judged to be of secondary importance. As you note, attributions change over time. What is once thought to be a Raphael is revealed, upon further study, to be by a follower or student (and vice versa, of course). Scholarship changes. As a side note, due to the large scope of many collections, museum front-line staff may not know individual objects in sufficient depth to answer questions about their whereabouts. You can do more of your own sleuthing by searching Cleveland’s collection online here. Good luck finding the answer to your mystery! My favorite from Rubens is The Raising Of The Cross. I have it as my desktop image. So, it’s the first thing I see as the computer goes on.